Through the years our definition of perfect changed until we finally arrived at the conclusion there is no such thing as a one-size-fits-all perfect beach. Fortunately, Siesta Key offers two distinctively different beach environments, and one of them will likely appeal to you. 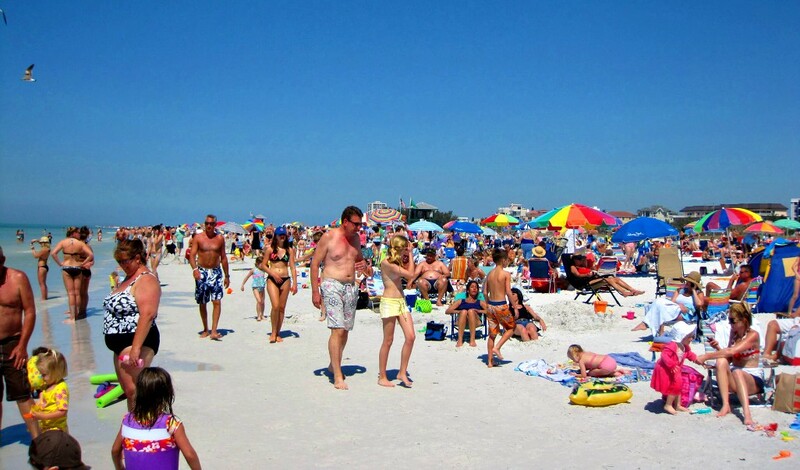 On the northern end of Siesta Key you’ll find Crescent Beach and Siesta Key Public Beach. 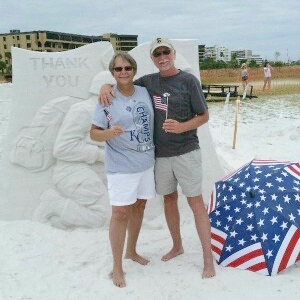 These beaches have the 99%+ white quartz sand that is commonly associated with Siesta Key. 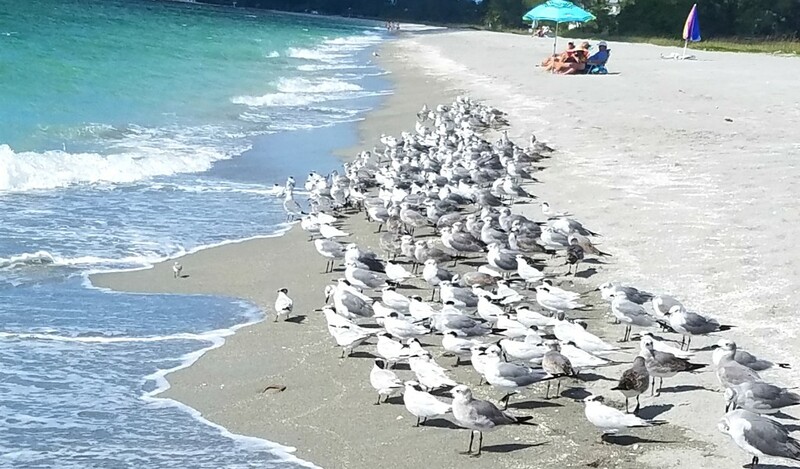 I think you should visit them at least once during a Siesta Key vacation, but be forewarned; by noon the roads and the beaches get very crowded and seashells are as scarce as parking places. If you want to be in the middle of the action, and you don’t mind the congestion, Crescent Beach is where you want to stay. However, when you shop for a condo there you need to be aware that even beachfront units are at least 500, and more often, over 1,000 feet from the Gulf. We are located at the quiet southern end of Siesta Key where crowds are sparse, seashells are abundant and traffic moves smoothly on a tree-lined street that has generous bicycle lanes on both sides. The pace here is laid back, and on any given day you’ll see far more birds on the beach than tourists. 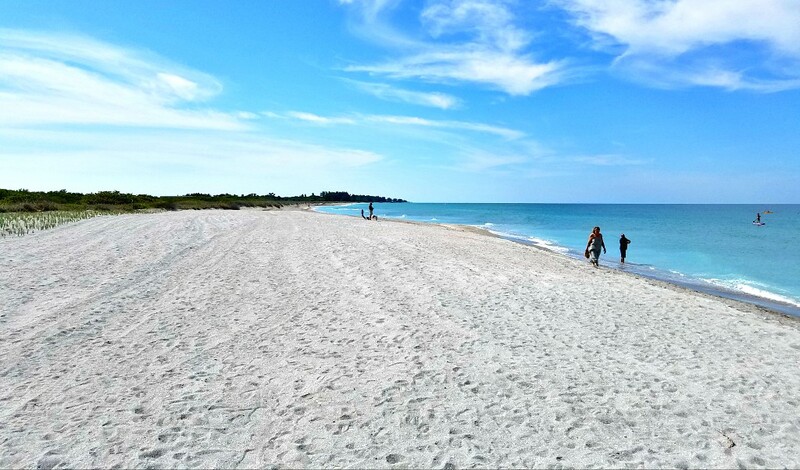 At the southern end of Siesta Key you’ll find Turtle Beach. The sand at Turtle Beach is similar to the very fine sand that you commonly see along the Florida Gulf Coast. 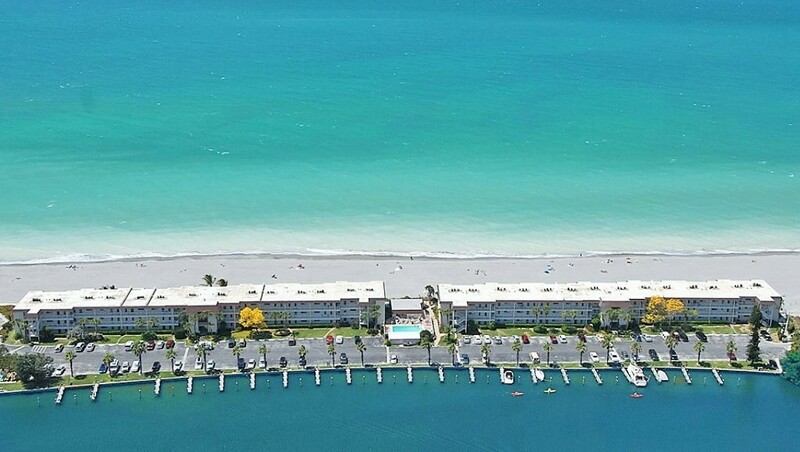 Our condo is immediately south of Turtle Beach, which is the best area for shelling and fishing on Siesta Key. Our condo sits on a VERY narrow strip of sand, which provides the unique benefit of every room having a direct water view. The lanai and Master Suite are direct Gulf-front (oceanfront) and even the kitchen has a direct Gulf-view. With the Gulf only about 125 feet from our windows, we are by far the closest condo the the Gulf of Mexico on Siesta Key and the only condo I know of on the entire Gulf coast that provides unobstructed direct views of the Gulf and Bay. We absolutely love being that close to the Gulf. In the mornings we enjoy a Gulf breeze while sitting on the lanai watching dolphins jump and birds dive for their breakfast, and at night we are lulled to sleep by the sound of the waves passing through the 4′ x 6′ sliding window in our oceanfront Master Suite. From our condo you can walk to the north about 1.5 miles before you come to the famed Point of Rocks. There is no beach at Point of Rocks, but on a calm day the area is good for snorkeling. To the south of us the beach extends further than your legs will probably take you. If you walk to the south from our condo you’ll pass by one small condo and about a half a dozen private residences. Following that you’ll find a mile or so of totally undeveloped beachfront. If you continue walking south, the next house you see is owned by the famous author, Stephen King. During my morning walks its often just me, the fresh seashells that washed up during the night and the waves gently lapping on the soft sand. Always a few steps ahead is the constant scurry of shore-birds running back and forth with the waves. In the Gulf Ospreys, Gulls and Pelicans dive for breakfast; interrupted briefly by a pod of dolphins jumping. 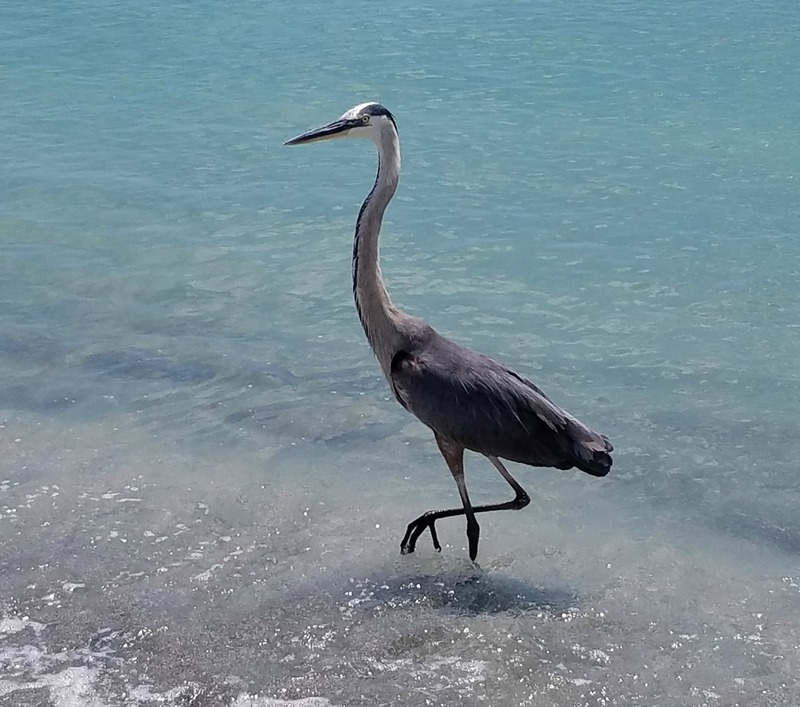 If you are carrying a fishing pole, which I often do, a Blue Heron will might tag along in hopes you will share your catch. The one you see here followed me for over a mile one morning, and was happy to pose when I got my camera out to take his picture. Fossilized shark teeth are fairly rare on Siesta Key. However, starting about a mile or so south of our condo you’ll often find small ones in the many piles of seashells that you will see along the beach. However, there’s always a chance you’ll discover a real treasure too. This fossilized Megalodon Shark tooth that one of our guests found in knee-deep water directly in front of our condo is likely over 5 million years old. 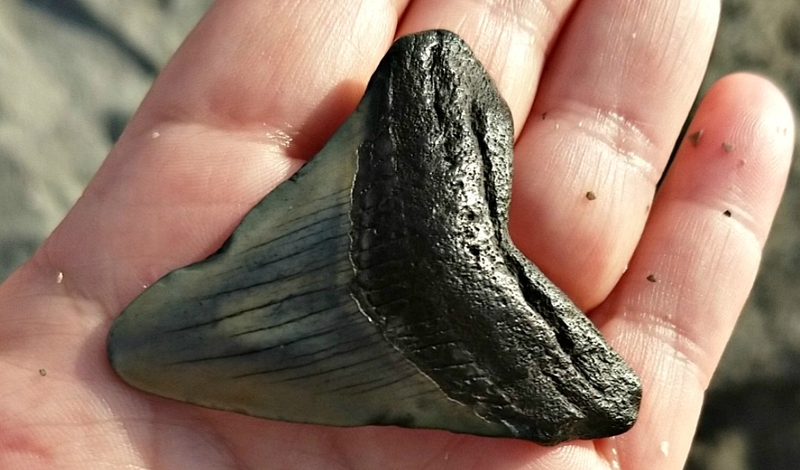 If hunting for fossilized shark teeth is something you would enjoy, we’ve got you covered. While the brochures will suggest going to Venice Beach, we found a much better spot where they typically lay on top the sand and you don’t have to dig for them along with a crowd of tourists. The moral to the story: While there is no such thing as a universally perfect beach, there is a perfect beach for you. It may be different from what we like, but that’s the great thing about beaches – there are plenty of choices and they all beat the heck out of shoveling snow.